As the saying goes there are always two sides to the same coin. 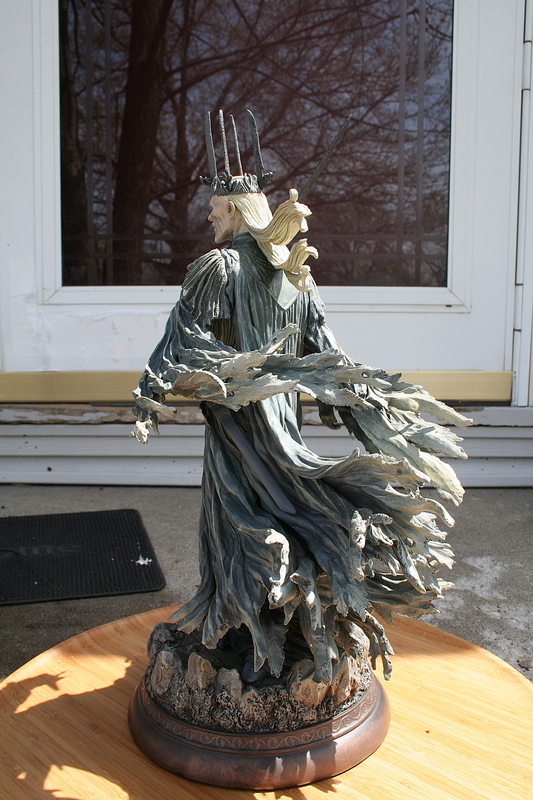 The last statue that from Sideshow Collectibles The Lord of the Rings statue line was the Witch-king as we see him before Frodo puts on the ring. Now, we get the other side of that same coin with the exception of this is what we see from Frodo’s point of view after he puts on the ring. 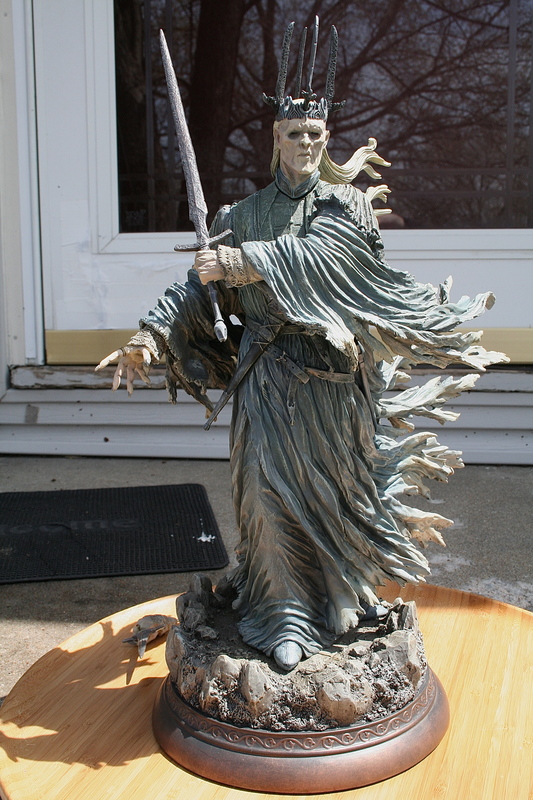 Both statues exclusive version come with him holding the Morgul Blade to give you the full effect of both points of view. The graphics on the outside of the box follow the same pattern set by the previous statues in this series. Following the trend as I mentioned about being the other side of the coin this box instead of being black is all white, with the exception of The Lord of the Rings being in gold and the character name in a silver. While the sides of the box you get an image of the statue from two different angles. The material of the box is continues the matte finish we saw with the last statue. The inside of the box saw the biggest change though from previous statues even the last Ringwraith statue. The flowing robes of the Witch-king caused Sideshow to create a big hole that made the Styrofoam adequate for the robes. There have been a few cases where despite the best efforts to make sure this statue arrived ok that it did show up broken. Gabriel Marquez was once again tasked with bringing a Ringwraith to life all while capturing the evil and power they posses. As was the case with the other statue the job done bringing this side of the character to life was superbly done. The complexity of this statue is actually much more difficult than his previous effort because of the massive flowing robes. The robes are very intricate and have been sculpted in a way that it has the feel of the Wraith world, but also has cloth look we’ve come to expect from the talent at Sideshow. Unlike the previous statue there is a facial sculpt that must capture the likeness of the Witch-king as Frodo saw him after he put the ring on. 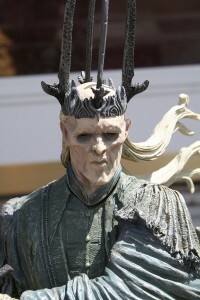 When we see the Witch-king he looks he looks like a man long dead who is still lingering due to the power of Sauron, and this statue has captured that look as fantastically as can be done. 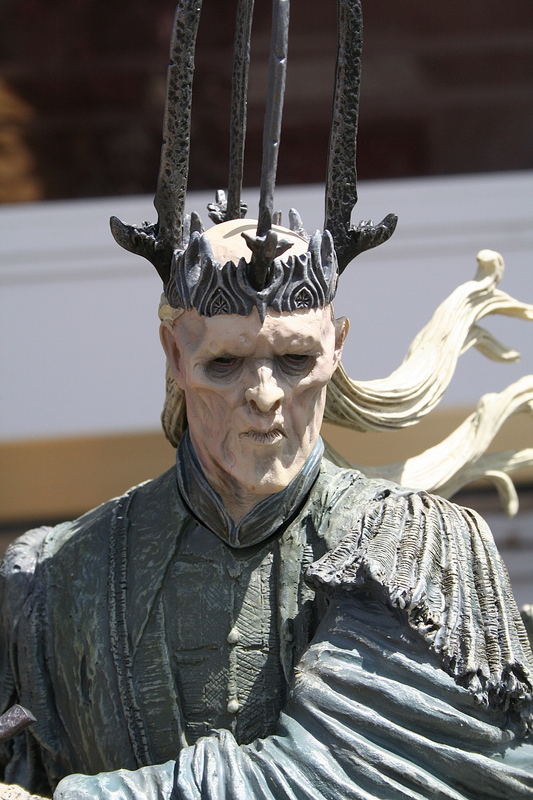 You get great detail in the cheekbones and sunken eyes that the Witch-king has when you see him. His crown also looks like long worn metal that should have fallen apart years ago. The same can be said with his sword and if you get the exclusive the Morgul Blade that he stabs Frodo in the shoulder with. Normally, when you have a statue with a likeness you want a nice skin color that looks like someone who is still among the living. That is not the case though with the Witch-king since he is no a member of the Wraith world. His skin tone is the proper pale looking color we see on screen, while also matching the pictures of the costume outside of that scene. It very much gives you the feel this is someone who is no longer human and has long given himself to the will of Sauron. The robes have a great mix of grey, blue, and white to very much give that Wraith world feel you get from this particular moment. The previously mentioned metal parts would not have that worn feel they have within the sculpt if it wasn’t for the great job creating a worn metal paint look. So again the paint only helps add to the feel this piece has of someone who has been around for quite some time. The base is not to be left out of the discussion for how nicely this piece is painted giving that old run down look Wetathertop had when Strider and the Hobbits rested there. 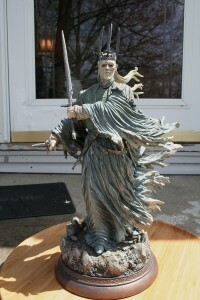 The Witch-king costs $275 from Sideshow Collectibles for both the exclusive and regular versions of the statue. The exclusive has an edition size set at only 300 pieces while the regular has an edition size of 1000 pieces world wide. There is currently a wait list for the exclusive but the regular version is in stock. 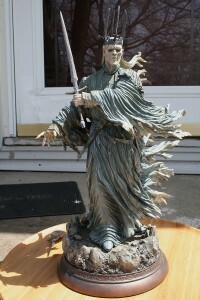 Do not let a collectible as well done as this one slip by so go to Sideshow’s site right now and purchase this statue!